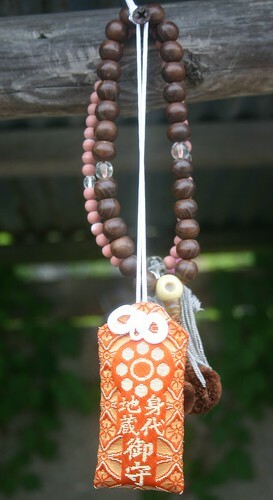 Omamori (good luck charms, or talisman) are normally associated with Shinto but the prayer beads with Buddhism. It is quite common for Buddhist temples in Japan to sell good luck charms however. I have a theory that Joudou ShinShuu or "Pure Land" Buddhism may be based upon Catholicism. Or, if not actually based upon Catholicism in inception, taps a similar religious sentiment, and when Catholicism was outlawed in Japan, may have been the religion of choice for those that would otherwise worship Christianity. 3) The vow of the Amida Buddha is to bear our sins and lead all into enlightenment. 5) It is especially for sinners - even the bad can reach enlightenment if they believe in and worship the Amida Buddha. Interesting difference - The Amida Buddha is neither male nor female.